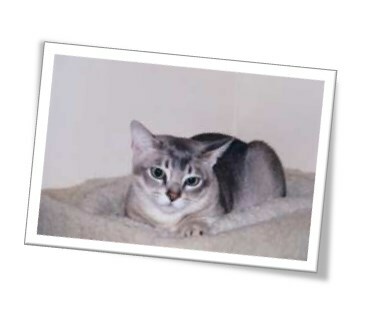 ﻿ Honpuss is a small cattery, specialising in Burmese and Asians cats. Honpuss is a small cattery based just outside Reading in the small village of Farley Hill in Berkshire, specialising in Burmese and Asians cats. Honpuss is a small cattery based just outside Reading in the small village of Farley Hill in Berkshire, specialising in Burmese and Asians cats. My kittens are all born in the house and grow up as part of the family. Where can I start – it’s love in a fur coat, it’s a brick wrapped in silk, it’s a Velcro cat. Burmese are all these things but they are also incredibly beautiful. 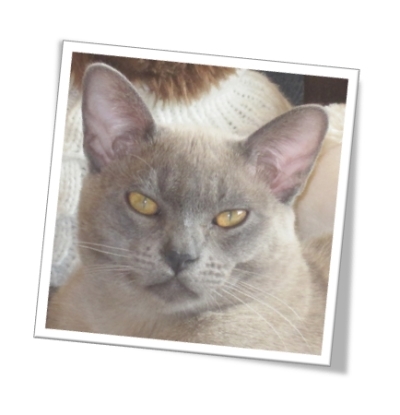 They are gregarious, outgoing, intelligent ,friendly, fun loving and it is all these characteristics that make up a Burmese cat. They are not a cat to be left alone, they need the company of either other pets or people and like nothing more than snuggling down on an accommodating lap. They delight in "helping" manage the house. The females like to be at "center stage" and assume an active role ruling the household. The males prefer to supervise from the lap position; they are more laid back and less opinionated. 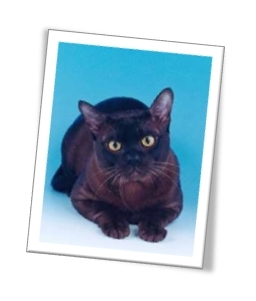 Burmese cats are people-oriented and almost doglike in personality. They shadow their owners and desire to give and receive affection. 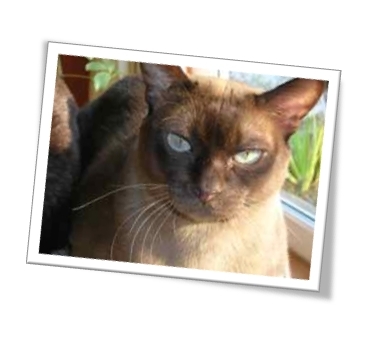 Burmese are true lap-loving companions: quick to learn and extremely loyal. 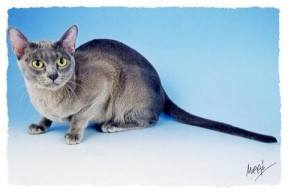 The Burmese is strong, athletic and elegant, of foreign but not extreme type which is distinctive and quite individual. A characteristic feature of the Burmese is it’s amazing coat which is close lying with a glossy, almost polished quality that requires little or no grooming other than a daily stroking. 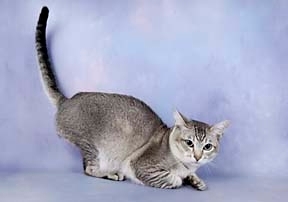 This together with a rounded head, expressive eyes and a sweet disposition, present a totally distinct cat which is comparable to no other breed. 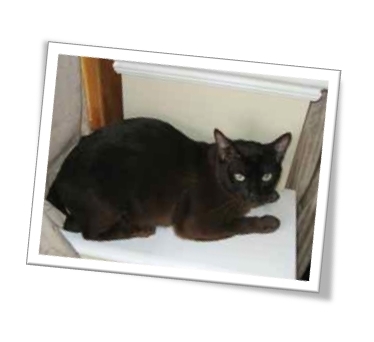 Burmese cats have been known for centuries past living in Burma, Thailand and Malaya, and have been imported along with the Siamese, and could be found in the UK in the late 1800’s and were known as Chocolate Siamese, but were nothing to do with chocolate pointed Siamese which appeared later. At the time these yellow-eyed cats were never favoured and gradually the breed died out in England, but persisted in Europe for some time. In 1930, Dr Joseph C Thompson of San Francisco, California, a retired naval officer and practising psychiatrist, imported a little brown female called Wong Mau. 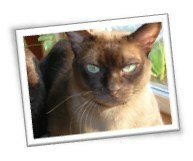 This is the cat that is accepted as the original Burmese. 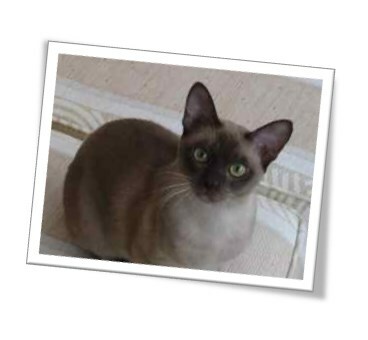 Many breeders of that time regarded Wong Mau as a dark Siamese, but when she was mated to a seal point Siamese the resulting kittens were both pointed and brown kittens. 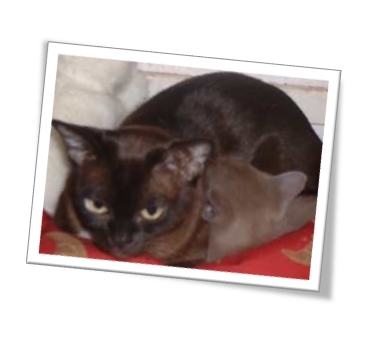 One of the brown kittens was mated back to his mother and the kittens were all brown and the Burmese cat was born. 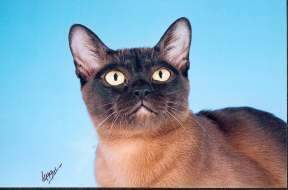 The first US bred Burmese were imported into the UK in 1949 but the Governing Council of the Cat Fancy were not loathe to grant breed recognition to the Burmese based on the US pedigrees. Recognition was eventually granted in 1952 after three generations were bred here. 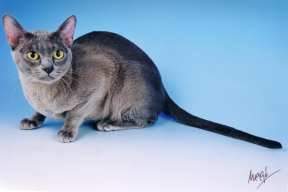 The first blue Burmese was born in the UK in 1955 and sparked controversy among Burmese breeders as many would only accept Brown kittens in their breeding programmes. But as we can see, with the myriad of colours in Burmese today not everyone felt this way and we now have 10 different colours, Brown, blue, chocolate, lilac, red, cream, brown tortie, blue tortie, chocolate tortie and lilac tortie. 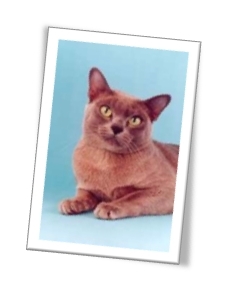 Whatever colour the Burmese cat is it’s most outstanding feature is its affectionate nature. 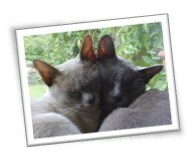 You can be guaranteed a loving welcome when you share your life with a Burmese. 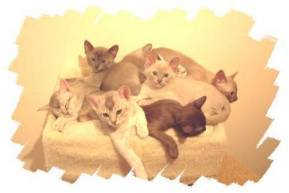 After 6 years breeding Burmese I bred my first Asian litter. 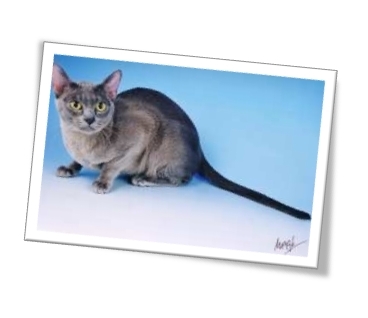 The Asian breed (originally an accidental mating between aBurmese and a Chinchilla) looks just like a Burmese but in a wonderful array of coat colours and patterns. 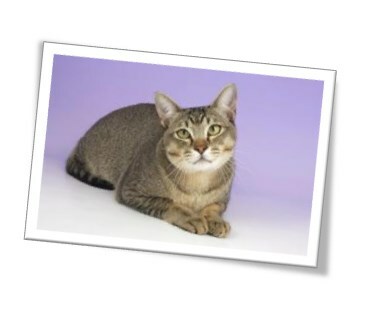 They are affectionate loving cats with the charming Burmese personality. 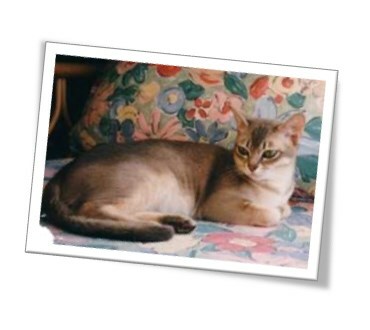 I mated Willow to Deborah Laughers Ch Kennbury Lohr Deaconblue and on March 18th 2003 Willow gave birth to 7 beautiful kittens. Linda Taylor had the only girl in the litter and my good friend Dee Cowell one of the boys. 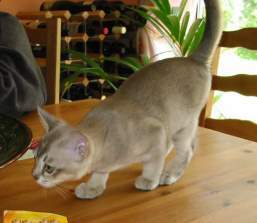 Tuki (I Gr Ch Honpuss Elanay Tukana) gained her Grand title at the Wiltshire Cat Club show on the 5th July 2003 on the same day as her brother Ziggy (UK Gr Pr Honpuss Ziggy Stardust) gained his. 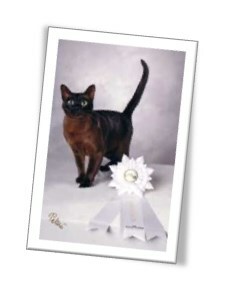 In 2003 Ziggy won his first UK Gr certificate and was Best of Variety at the Supreme cat show gaining his UK status in 2004. 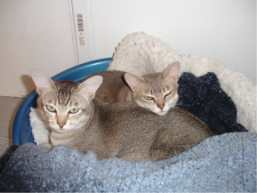 These two beautiful cats also thrilled me by winning Best of Variety adult and Best of Variety Neuter at the London show the same year. Today Tuki has two Imperial Grand certificates won at consecutive shows – so watch this space! Willow had her second litter of Asians to Alison Beattie and Bruce McClachlans beautiful UK Gr Ch Beannocht Pendragon. My own Honpuss Ziath won Top Ticked Tabby Kitten in the Asian Cat Associations show cat competition and Honpuss Galioth won Best in Show Foreign kitten at the Bucks Oxon and Berks Cat Club show in 2004. 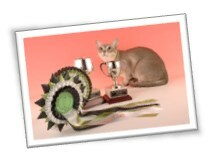 Zia gained her Championship title at Southern Counties Cat Club show in January 2007 also winning Best Asian Adult in show. Unfortunately Jasmine did not share my enthusiasm and began to hate shows actually becoming quite aggressive, so at the end of 1996 she was retired to attend to maternity duties. 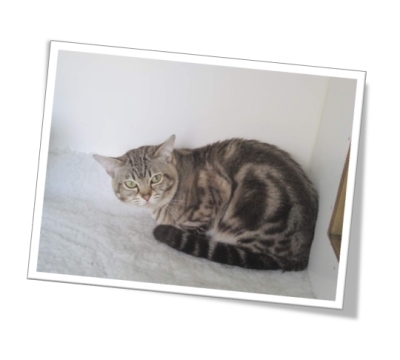 On the 26th January 1997 Jasmine gave birth to 8 kittens sired by Champion Kizwozzi Oliver, it was actually Oliver’s last litter. 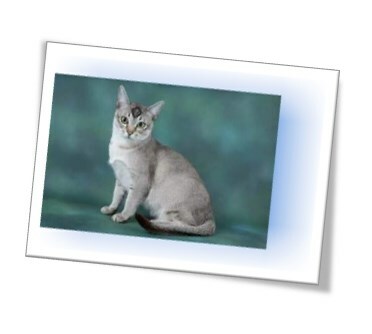 One sadly, was born dead but the others were lovely bouncing babies, five brown boys, one brown girl and a blue girl - who later became my first homebred show cat who to my absolute joy is now UK Gr Ch Honpuss Silver Willow. Jasmine went on to have two other litters, this time to Marilynn Sneesbys beautiful chocolate boy Gr Ch Katome Choccee Wallace before being neutered. These two litters gave me my own Ch & Pr Honpuss Wally Too and Gr Ch & Gr Pr Honpuss Tiger Wolf. 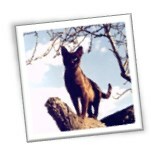 was formed in 1955 and is one of the largest cat clubs in the UK with a national and international membership. 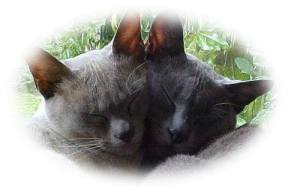 We exist to safeguard the wellbeing and the purity of the breed, and to encourage a wider appreciation of the unique qualities of Burmese cats. We are a GCCF-affiliated club catering for all varieties of the Asian group, established in 1985 by the breed's founder, the late Miranda von Kirchberg. 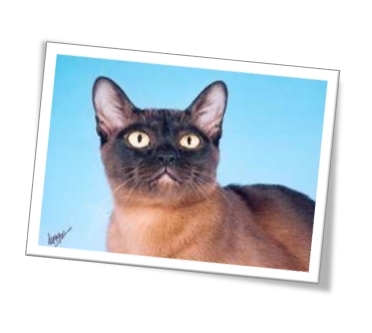 is a GCCF affiliated specialist breed club dedicated to the advancement and welfare of the UK Bombay and related self colour cats of Burmese type. 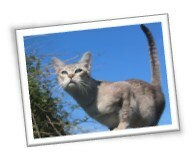 Welcome to the website of International Cat Care – a charity dedicated to improving the lives of all cats. On our website you will find advice for cat owners, cat care professionals and the veterinary profession, as well as information on the welfare work we do across the world, and the important campaigns we run.